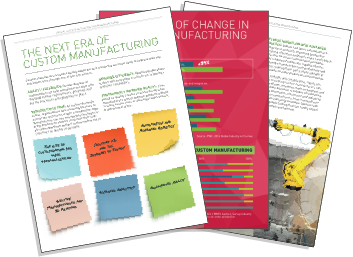 Download the "Critical Success Factors For Custom Manufacturing" whitepaper and learn how to leverage operational agility with the help of an an ERP platform that integrates all your business operations, from the factory floor to the back-office and into the supply chain. Learn the critical success factors for fast, efficient custom manufacturing. Foremost is although the benefits of customized products are numerous, manufacturers must still apply the right combination of product technologies and operating practices. The guide discusses: Stages of personalization, the essentials of mass customizations, and an updated look at the tech trends that are most likely to improve manufacturer top and bottom lines in the near future. Learn how an agile supply network can impact delivery on product variations and quickly respond to sudden project changes. Key is the ability to communicate realistic lead times to customers and can be given reliable, real-time progress updates. Learn more about where custom manufacturing is going, what’s driving the industry's growth, and how modern ERP fits in! Download your copy of this informative guide today.